So here we are! 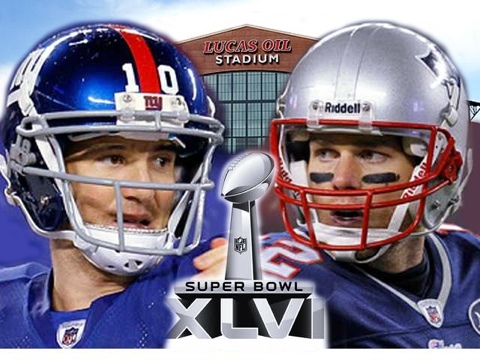 Finally it is Super Bowl week and all eyes are in Indianapolis, Indiana the host of Super Bowl XLVI. This year’s Super Bowl may be the most anticipated Super Bowl as the New York Giants square off with the New England Patriots in a rematch of Super Bowl XLII. As we all remember Eli Manning engineered a late touchdown drive to lift the Giants to an upset win over the previously undefeated Patriots. How will this Super Bowl play out? Here is my take on how things will happen. Eli Manning, Tom Coughlin and the New York Giants are back in the Super Bowl. Unlike 2007 the Giants are not the overwhelming underdogs and many expect them to win. Although the Giants defense may not be as good as it was in 2007 statistically, their defense had gone on a roll at the right time. It all starts with the pass rush from the collection of defensive ends the Giants have. 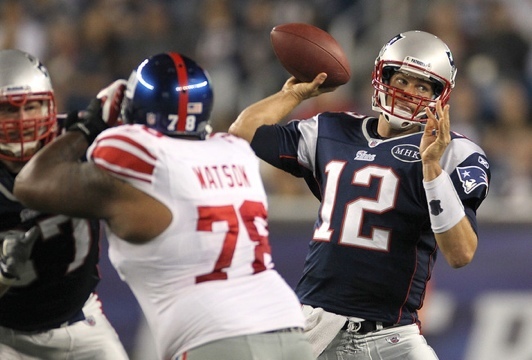 Osi Yumenyiora, Justin Tuck, Jason Pierre-Paul, and even Mathias Kiwanuka will have to apply pressure on Tom Brady early and often. In week nine of the season the Giants were able to get to Brady once again. Expect to see the Giants to employ their NASCAR package often and get their defensive ends after Brady. The ultimate key to success for the Giants will be the play of Eli Manning. Before the season Eli said that he was elite and his gone out and proven that this season. During their week 9 matchup Manning led the Giants to victory over the Patriots with a last second touchdown pass to Jake Ballard. Eli has to continue that elite play on Sunday. This year Eli has a lot of weapons with receivers Hakeem Nicks, Victor Cruz, and Mario Manningham. Eli needs use those weapons to terrorize the shaky Patriots secondary. If Eli can play at the level he’s been playing all season he has a good chance of claiming his second Super Bowl title surpassing his brother Peyton in the building Peyton built. Their 5th Super Bowl appearance in 11 seasons, sure fire Hall of Famers Tom Brady and Bill Belichick are looking to cement their legacy as the best ever at their job with a 4th Super Bowl title. In 2007 the Patriots had the weight of a perfect season on their shoulders and fell short in a stunning loss to the Giants. The Patriots also lost to the Giants in week 9 of this season. In that game Eli Manning picked apart the Pats defense. Yes, the Patriots have the worst defense to ever make the Super Bowl ranking 31st in the NFL, but they haven’t played that poorly in the playoffs. That Patriots defensive resurgence has been led by nose tackle Vince Wilfork. Not only is Big Vince occupying two offensive linemen on almost ever snap, he is also applying pressure on the quarterback. 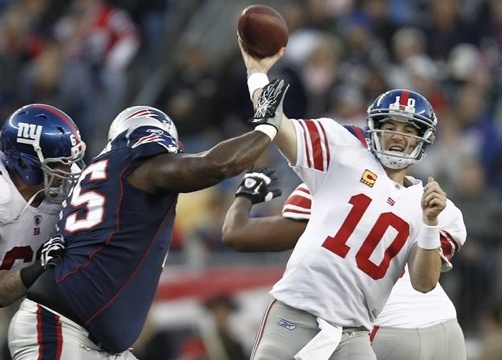 Wilfork must continue to be disruptive in the backfield and make life harder on Eli Manning. The defense has also been playing better with the return of safety Patrick Chung from injury and the Devin McCourty move from corner to safety. We know linebacker Jerod Mayo will be all over the fields making stops as he is the quarterback of the defense. The Patriots are also getting good play from lesser known players such as Sterling Moore, Brandon Spikes, and Rob Ninkovich. The Giants have a decent offensive line but I believe they can be beat. The Patriots offensive line will have to be at its best protecting Tom Brady. Sebastian Vollmer should be back for the big game and that will help to keep Brady upright. In the end the success of the Patriots relies on the right arm of Tom Brady. After a subpar performance in the AFC Championship Game Brady had vowed to perform at his best in Super Bowl XLVI and I would not doubt him. In order for Brady to be at his best tight end Rob Gronkowski has to be on the field. The storyline of the week has been the ankle of Gronk. The high ankle sprain he suffered is the worst of the ankle sprains but Gronk will be out there. The question will be how effective he is going to be. I believe Gronkowski will play and play well. Brady must also feed Aaron Hernandez and Wes Welker the ball often. The Patriots must pick on the smaller Giants safeties. I know I said this last week and he was inactive due to a death in the family but look out for Chad Ochocinco. The Giants can be beat on the outside and this may be Ochocinco’s last shot to contribute to the team. Ok, prediction time. This one is really tough because the Giants are playing so well on both sides of the ball. With that being said, Tom Brady is on a mission. Tom doesn’t follow up a stinker with another stinker. I see Brady having one of the better performances in Super Bowl history. I will stick with my preseason selection as Tom Brady and Bill Belichick will win their 4th Super Bowl and cement their legacies as the best ever.